It's not every day you get to see a bald eagle in the lower 48. Much less see one on the golf course you're playing. And see one land on the putting green and steal your golf ball. Hey! Hey, you damn bald eagle! I don't care if you're the symbol of our country, get back here with my golf ball! The incident was caught on video by golfer Joe Saletto, and it was Joe's ball that this thieving eagle flew off with. It happened on the 12th hole of North Bellingham Golf Course in Bellingham, Wash.
For many golfers, golf and beer go together like ... well, like golf and beer. You can't play golf without downing a few beers. At a minimum, after the round; preferably, during the round. Combine that golf-and-beer twinning with the craft beer craze, and what do you get? You get Graeme McDowell, Keegan Bradley and Freddie Jacobson forming a company to market craft beers they created. The idea actually started with Jacobson, who then brought in Bradley and McDowell. This threeball and their company, Golf Beer Brewing, will start selling their beers on tap at Florida golf courses and select golf course bars and restaurants beginning this year. In 2015, the beers will be marketed in bottles and cans, at grocery stores, bars and restaurants outside of golf courses, but at first only in Florida. Expansion to later markets will follow. According to USA Today, each of the beers if 4.5-percent to 5-percent alcohol by volume. Thanks to Golf Digest for reminding me about The Caddy Girls pitch on the ABC show Shark Tank. But, as Melanie Griffith said in Working Girl, Tarmey must have a mind for business to go with that bod for sin. She started Caddy Girls while she was still in college and has grown it into a lucrative business. So lucrative that she has big expansion plans and is seeking investors. Which is why she was on Shark Tank. Tarmey was asking the sharks for $100,000 for a 20-percent stake in the company (which creates a valuation of a half-million dollars). The sharks said no. Head shark and head case Kevin O'Leary countered by offering Tarmey $100k for 50-percent of Caddy Girls. Tarmey said no. It was a no-no show for Caddy Girls. The Caddy Girls was not the first time hot women were hired and trained as golf caddies (nor the first to misspell caddie), but Tarmey's company has certainly become one of the most prominent and successful. You can follow them @thecaddygirls, or check out the website - where Caddy Girls can be booked - at thecaddygirls.com. 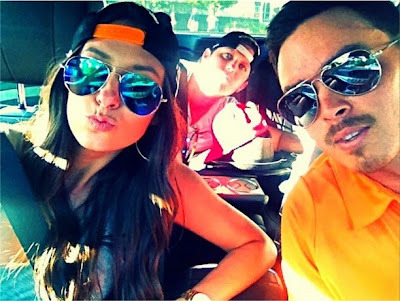 And The Caddy Girls aren't just in Myrtle Beach anymore. They are also in Atlanta, Dallas, Oahu, Los Angeles, Las Vegas, Miami, Nashville, Orlando, San Diego and Scottsdale, among other places. Meghan might be disappointed that she didn't come out of Shark Tank with the investment she was looking for. But she seems to be doing great already, and her business will surely continue to grow. The one above was captioned by Alexis this way: "picked up some random at the bar last night @therealrickiefowler"
Randock is 24 years old. She attended Arizona State University. She is a model signed with the world-famous Wilhelmina Agency. 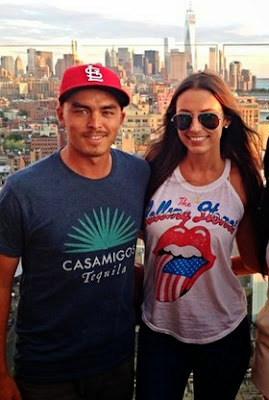 Yep, it's good to be Rickie Fowler. We haven't done any "Pro Shop Finds" entries in a while because, well, there just hasn't been much in the way of new or funny or innovative or weird golf equipment crossing our transom. I know what you're thinking: So it's a golf bag on a push cart. What's the big deal? Ah, but this isn't just the usual push cart with a golf bag strapped onto it. No, this is all one unit. 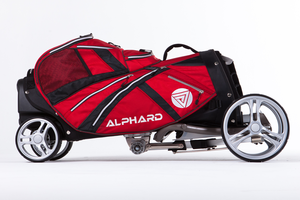 It's a golf bag-and-push cart in one. And I absolutely love this idea. It's called the Duo Golf Cart and the company that makes it is Alphard. 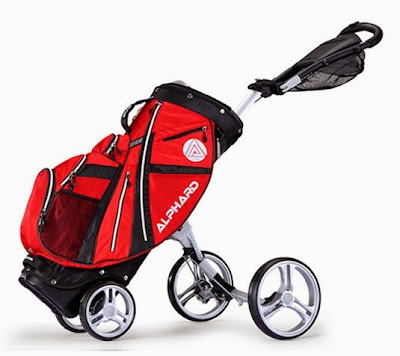 No more having to carry around a bag and also a push cart, get both of them into the trunk, take both of them out at the golf course, strap the bag onto the cart, then several times around have to adjust the bag and retighten straps because the bag keeps slipping out of place. The Duo Golf Cart even comes with hydraulics to make folding and unfolding easier. Yes, like a regular ol' push cart, this one folds down into a more compact size to make storage easier. Now, if you're a golfer who sometimes walks, sometimes rides, occasionally or frequently enjoys carrying your bag, then the Duo Golf probably isn't for you. Unless you can afford to have multiple bags for multiple occasions. But if you walk exclusively or close to it, and are tired of fighting with separate bag and cart, then consider combining the two into one product: the Alphard Duo Golf Cart. The only drawback, for those golfers suited to it, is the price: the models range from $329 to $379. On the other hand, if you're buying separately a nice bag and a decent cart, you can easily spend more than that. Check the Alphard Golf website for more info. Ouch. What a look on her face. To Lexi's credit she immediately counted the stroke, but that smile is the smile of a golfer who feels very embarrassed about what just happened. The whiff happened on the ninth hole and it meant a double-bogey for Thompson. She wound up shooting 71. Hopefully Lexi's whiff won't come back to haunt her the way one of the most infamous whiffed putts in golf history did Hale Irwin at the 1983 British Open. Irwin whiffed a 2-inch putt in the third round ... then finished one stroke out of a playoff. By now you've probably read Bob Harig's story at ESPN.com about the disastrous Saturday evening team meeting of the Americans at the 2014 Ryder Cup. Harig reported that Captain Tom Watson began the meeting by telling his players, "You stink at foursomes." Of course, given that the Americans had just gone 0-6-2 in foursomes, that's a pretty obvious statement. But it wasn't what the players wanted to hear in that setting; they were after some encouragement and optimism, and Watson's brusque, brutal (but accurate) assessment set the tone. The meeting was all downhill from there. Watson, according to Harig's sources, showed no appreciation when the team presented him with a personalized gift. In fact, he demeaned the gift, saying it meant nothing to him if Team USA failed to win. He also insulted multiple European players when going through the singles matchups for the final day. Quite a guy, that Tom Watson! Funny thing is: the PGA of America knew exactly what they were getting when they named Watson captain because he was a jerk the first time he captained, too, back at the 1993 Ryder Cup. When Watson captained the 1993 Team USA, he caused a stink the night of the gala dinner. It was tradition for the Ryder Cup teams to pass around their menus for the dinner, with each team member, USA and Europe, signing them. That way, every golfer in the event went home with a pretty neat memento. Watson, however, refused to let the American golfers participate. The Europeans were insulted and angry. Watson also reportedly "blew off" European team members that year. Watson later apologized, but also claimed his actions set a tone of seriousness and fight that helped Team USA win the Cup that year. In the aftermath of the 2014 loss, Phil Mickelson infamously, at the post-match press conference, let everyone know that Watson didn't consult the players at all about pairings, or keep them informed about his strategy, tactics or reasoning. Guess what? Captain Watson behaved exactly the same way at the 1993 Ryder Cup. When Watson was announced as captain again in late 2012, Tim Rosaforte wrote in Golf Digest about how Watson handled the team in 1993. "I don't think he asked anybody, to tell you the truth," Cook said when I reached him Tuesday evening. "He had his game plan with Stan Thirsk. He talked to Roy Williams, who was then at Kansas, about coaching. I know he had his practice pairings, but he just kind of observed, made his mental notes and made the pairings. We had such a complete trust in Tom and what he was doing. He was the captain. He ran the show. He took the bull and rode it all the way to the end." What you have to keep in mind, though, is that when reporters were reporting this stuff in 2012, at the time Watson was named captain, they were reporting it approvingly. Watson was the tough guy the Americans obviously needed to win back the Cup. Watson hasn't changed much over the years. He's still a jerk. But maybe the players have changed. Maybe they are too delicate now, to fragile in ego and intellect, to be treated that way. Or maybe it just goes to show that golf is a game full of vagaries, and captains and their methods don't really matter that much. Players playing well will win no matter how bad their captain is; players playing poorly will lose no matter how good he is. *Is 'flog' - whip it good!